A Brief History of Cocaine is a thoroughly researched, fascinating account of the role cocaine has played in worldwide history, politics, economics, and science. Travel with bestselling author Steven B. Karch as he traces the path of cocaine from the coca cash crops of Spain to the prestigious pharmaceuticals houses of Amsterdam into the banking industry of Japan. Learn about experimentation with the drug throughout the centuries, including the work of Sigmund Freud, who suggested that cocaine be used to treat morphine addiction. Discover how cocaine has been grown, refined, distributed, and abused around the wold for four centures. Finally, understand why the cocaine trade remains a thriving business dispite government regulation. An essential analysis of an age-old problem, A Brief History of Cocaine places the "war on drugs" in its historical context and predicts if we are destined to lose. 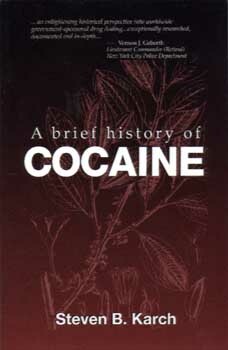 Documents the history of cocaine abuse and the cocaine trade, offering new insights into both. Explains the origins of "zero tolerance" drug policies and shows how the "war on drugs" had its origins 400 years ago. Shows how trade in coca has always been a thriving international venture, encouraged and promoted by cash-strapped governments trying to turn a quick profit. Chronicles 400 years of failed attempts to control cocaine use by drug interdiction, and by import and export controls. Examines the impact of cocaine abuse on society throughout the centuries.